HomeRun Maintenance offers simple solutions for the issues, big and small, a person’s home will face over the years. Whether it’s an electrical problem, drywall repair, pressure washing, pool care, carpet cleaning, landscaping, or any other home maintenance problem, a single call to HomeRun will solve it. HomeRun Maintenance is a new business in Wilmington, NC. In order to prepare for their official launch, they knew marketing, branding, and advertising would be an integral part of their success. They approached Sage Island to help them accomplish this challenge, and we were happy to design their logo, zero in on their audience, and create a trifold brochure that tells their story. Technically, HomeRun Maintenance offers a service that anyone who lives in a home, condo, or apartment can use. However, targeting that entire demographic would be difficult, not to mention expensive. In order to narrow the field and refine their strategy, the designers and writers at Sage Island took a few different approaches. We created marketing personas to zero in on a target audience. In order to create an effective marketing plan, we first had to zero in on who, exactly, our plan was targeting. We did this by writing marketing personas. A marketing persona is a combination of raw data, educated guesses, and creativity. The results are specific and detailed character sketches, including information such as name, age, gender, occupation, education level, interests, hobbies, values, fears, and other personality traits. By imagining these ideal customers, we’re able to craft advertising that appeals to them—and to all the people like them who actually exist. Moving forward, these personas will also help HomeRun Maintenance identify with their audience and offer them better service. 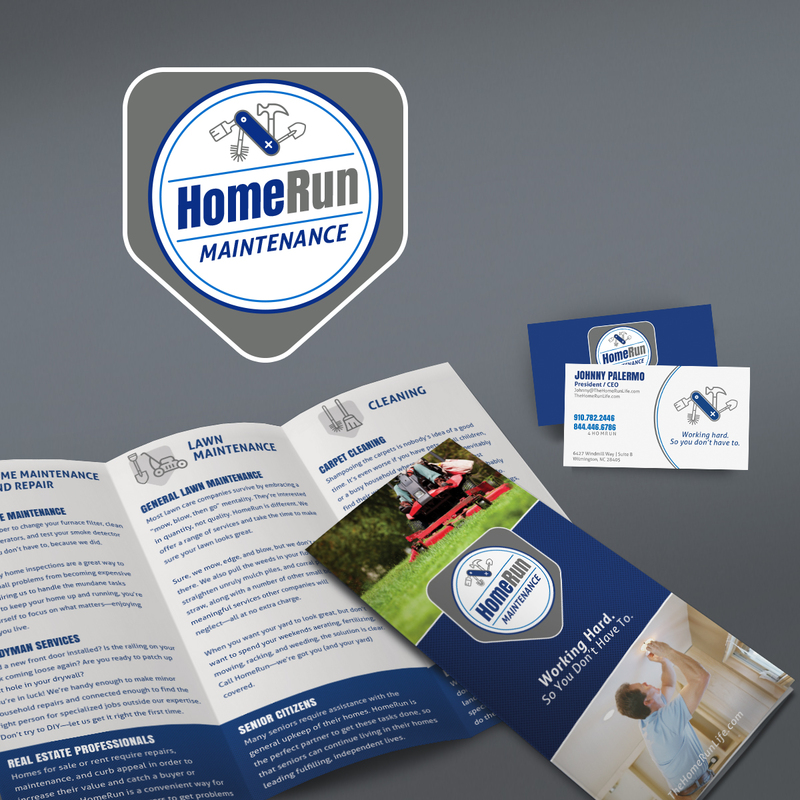 We designed a logo that sets HomeRun Maintenance apart. A memorable logo is an essential part of a business’s brand identity. It’s often the first thing people see when they encounter a business, and a business’s first opportunity to show who they are and what they do. Designing a logo for HomeRun Maintenance offered a few challenges. While the company is focused on home care, it offers a wide range of services. And while their name evokes the sporting world, they didn’t want to be confused for a baseball brand. In the end, our graphic designers struck gold. The logo is clean, unique, and, though an image of a Swiss army knife that wields home maintenance tools in lieu of knives and nail clippers, clearly and creatively demonstrates what customers can expect from this innovative company. Once the logo was in place, using it on various marketing materials, including business cards, rack cards, and company uniforms, was easy. We developed a trifold brochure to leave with potential clients. As much as we love digital marketing and social media, there are occasions when traditional advertising does the trick. When it came to HomeRun Maintenance’s demographics, we know this was one of them. Their target audience includes real estate agents, busy adults, and senior citizens, all of whom would benefit from a physical brochure. Senior citizens appreciate traditional ads, and real estate agents could keep brochures on hand to share with potential buyers and sellers. Keeping this in mind, we designed a trifold brochure that is clean, straightforward, and easy to read. It includes all of HomeRun Maintenance’s contact information alongside a bulleted list of their services. Inside the brochure is a narrative description of their services, as well as small blurbs about the groups of people they serve. The finished product is an effective and useful piece of marketing that a potential customer can hold, keep, and use to contact HomeRun Maintenance as needed.